Knight of Cups Tarot Card Meaning - All Explained HERE! The Knight of Cups is the twelfth card in the Cups suit. The Cups are a positive suit, and the Knight of Cups is no different. With slight romantic undertones (think of the traditional Knight saving the Princess), the Knight of Cups is all about good news, and positive change. 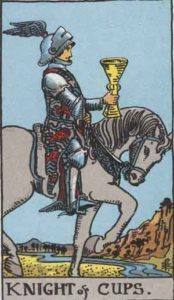 The Knight of Cups represents a change for the better, new opportunities and good messages. Past – The Knight of Cups in the past position can represent a past time of good activity, definitely a high point in your life where you were progressing as you wanted to. You were reaching new horizons that you’ve since travelled far beyond. The Knight of Cups can also represent a past relationship, possibly your first serious relationship. It’s likely that there are either lessons to learn from it, or that your partner from then will appear back in your life. Present – The Knight of Cups in the present position can mean you’re currently on a plateau as far as life is concerned. You might be thinking about your next adventure and looking for new goals. It could be that you feel stuck where you are now, and you’re waiting for a way out, usually a favour someone owes you or a task that only you are able to complete. If you’re in a relationship, you may be expected to make a choice between what your heart tells you, and what your head is saying. Future – The Knight of Cups in the future position reminds you to stay focused. To truly succeed in anything,you initially need passion and a clear goal at the start. As you move on, you need willpower and mental strength. Expect yourself to grow emotionally over the coming months. Work / Education – The Knight of Cups in regards to work or education means things should be going quite well. You might not be high up in the hierarchy, but you’re certainly making a name for yourself. The only advice is to continue how you are now. If you’ve got a lot of energy left over, consider doing something outside of work or extracurricular. There is potential for a promotion if you can dedicate yourself to it in your current workplace, but look to see if you are following your heart. Are you doing what you truly desire? In a professional sense, we rarely do what we actually want. We work because we need to, or we study something we don’t like because we know in the end that it will pay well. This isn’t the right approach for everybody, so make sure you are learning and working on what you feel you want to spend your life on. Romance – The Knight of Cups in romance is a good sign if you’re about to propose, or waiting for a proposal. Expect the outcome you want. Not much more can be said. Think about the nice aspects of your partner. If a proposal isn’t on the cards, then expect a deeper than current level of commitment, even if this is just a good deep conversation with your partner. If you’re single, then it’s up to you to embody the Knight of Cups and let your prospective partner know how you feel. You may feel regret if you propose something and you are rejected, but you will soon recover. The real regret comes when you do not put anything forth. Any decision you think about for too long will simply be made for you. Friends – The Knight of Cups in regards to friendship can signify an upcoming trip you’re all going to take, or a joint venture that would be too good to miss out on. If you weigh it up and the gains outweigh the risks, just go for it. You only live once. What have you always wanted to do with your friends? If you’ve wanted to take a trip somewhere together, then plan it soon. It might be up to you to motivate everybody, but once you start working together, things will be easy. Money – The Knight of Cups in regards to finances is another good sign. The Knight of Cups should really mean you’ll see an increase in your finances soon. Things are not as bad as you think, and there will also be a beneficiary somewhere to help you out. Linked to the Work/Education section, you may be offered a new job or promotion, which should see an increase in your finances. Health – The Knight of Cups generally has a ‘Yes’ vibe to it when you ask a question. If you’re nervous about your current physical state of being, expect an improvement. Mentally, try to constrain your thoughts and don’t let them go wandering too far. Focus. Spirituality and Mentality – The Knight of Cups in spirituality reminds you to understand how life is a big web of possibility and opportunity. There are so many doors open and shut every hour of every day. Look for ways that life is telling you to move in a certain direction, and follow it. In reverse, the Knight of Cups can represent the more negative aspects of this card. Emotions can plague all of us, and the Knight of Cups reversed can emphasise the times when your emotions are getting the better of you. You may have just been rejected, and whether this is something romantic or not it is something that has hurt your feelings. Your mental health could be on a low right now, so look to see what things you can simply let go of. You might be carrying a lot of emotional baggage around that only affects you. If there are any toxic people in your life, look to cut them off. We’ve selected live tarot readers to give you a FREE 3 Minute interpretation of The Knight of Cups! Scroll through them below and pick your favorite one.